Comet Lovejoy skimmed across the Sun's edge about 140,000 km above the surface late Dec. 15 and early Dec. 16, 2011, furiously brightening and vaporizing as it approached the Sun. This images shows the comet during that time as seen by the SOHO spacecraft. Comets skimming past the sun may seem like ill-fated cosmic snowballs, and a team of scientists is trying to figure out what makes some fizzle and others explode as they make their solar death dives. Research into these doomed comets may yield clues on the origins of the solar system, as well as shed light on the potential risks the comet deaths on the sun could pose for us on Earth, scientists say. In recent decades, astronomers have witnessed even dramatic interactions between comets and the sun, with thousands seen falling near or into our closest star. Now researchers are analyzing how these so-called sun-diving comets lose their mass and energy depending on how close they get to the star. "In modeling how icy comets behave in this extreme environment, we really are starting to understand what happens to these 'supersonic snowballs in hell' when they make a close approach to the sun," said study lead author John Brown, Astronomer Royal for Scotland. "Such data can show us for the first time what is inside a comet," Brown told SPACE.com. "All other data to date, apart from Jupiter impacts like Shoemaker-Levy 9, are only from the surface layers." The researchers found that "sunskimmer" comets — ones that dive toward the sun but not into its lower atmosphere — can slowly get vaporized by sunlight in deaths that last hundreds to thousands of seconds, depending on their mass. During such demises, the scientists calculated that the comets should emit weak but detectable extreme ultraviolet radiation. In contrast, "sunplunger" comets that get even closer to the sun will meet their demise in only a few seconds, as they collide with the dense layers of the sun's lower atmosphere. The resulting explosions typically generate effects similar to those of solar flares, such as sunquakes on the solar surface. If the most massive comets smashed into the sun, they would produce dramatic explosions just above the photosphere, the researchers said. 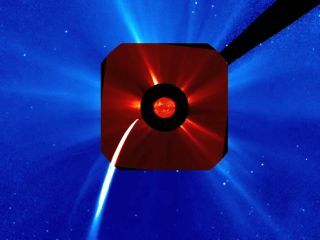 To create their model, the scientists looked at the first direct observations of sunskimmer comets, captured last year by NASA's sun-watching Solar Dynamics Observatory (SDO). The first comet, C/2011 N3, was completely destroyed after passing about 62,000 miles (100,000 km) above the photosphere. The second and larger comet, Lovejoy (C/2011 W3), survived a close approach to a similar distance of 87,000 miles (140,000 km), although it lost a significant fraction of its mass in the process. Both events were in line with the predictions of the researchers' new model. Comet Lovejoy did pass through the sun's million-degree corona, but its survival was not miraculous, Brown said. The corona is hot, but its density is so small that the heat Lovejoy experienced "would be quite safe even on our skin," he explained. Comets might help serve as probes of the sun's atmosphere and magnetic field, helping to uncover its secrets. They are also thought to date back to the formation of the sun and the planets — as such, ones that dive toward the sun could, in their death throes, reveal important details not only about themselves, but also the early history and composition of the solar system. "The two sunskimmers seen last year have already given us a new insight into the sun's atmosphere and it's only a matter of time before we see the flare from a sunplunger with a low enough orbit to reach the lower atmosphere of the sun," Brown said. "When that happens we will be able to analyze the light from the resulting 'cometary flare' and find out even more about the composition of the interiors of comets." The cometary flares that the very largest comets might release if they slammed into the sun can be 100 times more energetic than the largest solar flares ever observed, "and so could be dangerous not only to spacecraft and power lines and communications, but even to our atmosphere," Brown said. "Such comets are, however, very, very rare today, though they may have been commoner in the early system." Brown and his colleagues detailed their findings Friday (March 30) at the National Astronomy Meeting in Manchester, England.